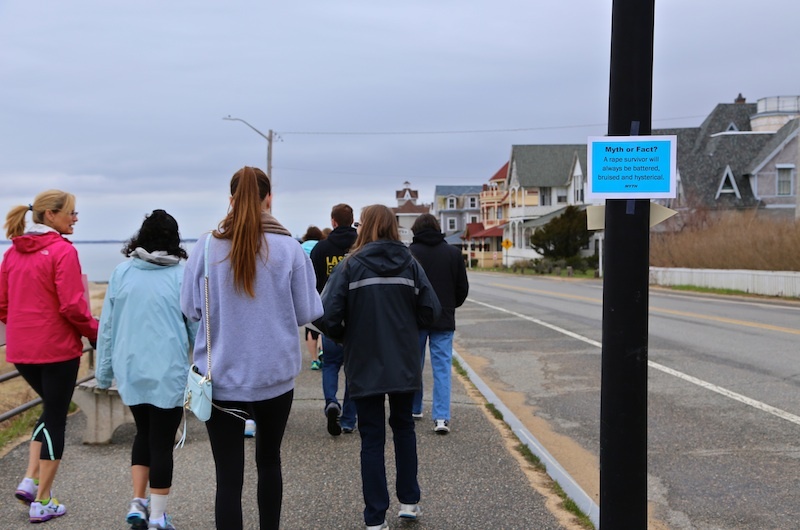 A group of about 30 people walked two miles along Beach Road in honor of victims of sexual assault. 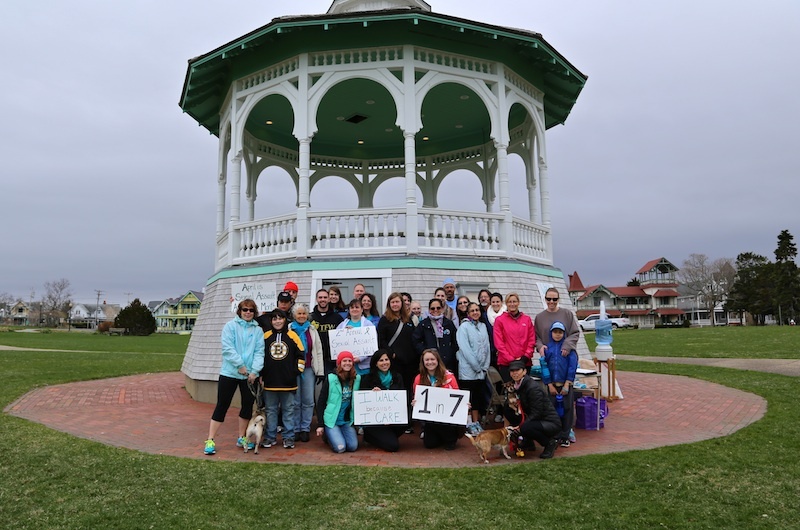 A passionate band of Islanders took to the streets of Oak Bluffs Sunday in honor of victims of sexual assault. 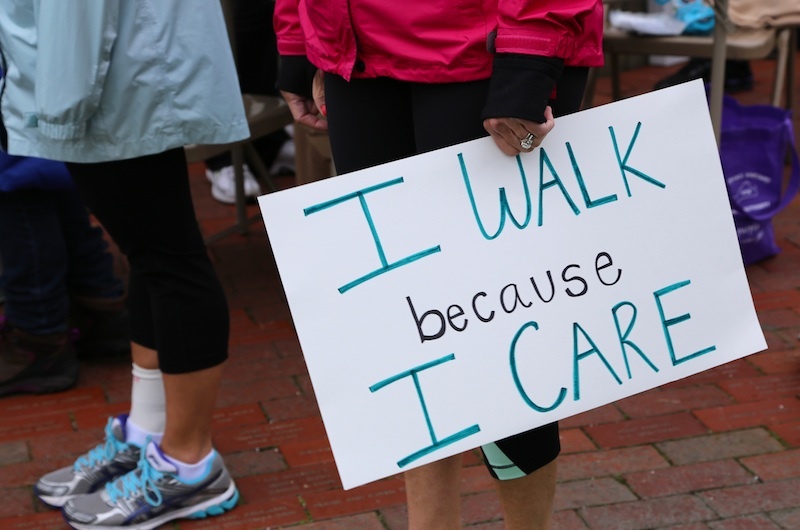 Bearing signs and wearing teal blue T-shirts that read, “I Walk Because I Care,” the group of about 30 walked two miles along Beach Road in honor of the survivors in their lives. “It’s about getting the word out that we are not going to put up with anybody being assaulted,” said Debbie Stevenson, who walked with her family and said she knew survivors of sexual assault. The sponsoring group, Connect to End Violence, is a program at Martha’s Vineyard Community Services that provides free and confidential counseling to victims of domestic and sexual violence and their families. The program, which was founded in 1981 as Women’s Support Services, promotes healthy relationships in schools, operates a 24-hour hotline and provides advocacy for victims in the court and police stations. Sexual assault is a substantial issue on the Island, said Connect program director Jennifer Neary, as people lined up to register at the bandstand in Ocean Park. She said the perpetrator of the violence is often a loved one or an acquaintance of the victim’s. Connect counselor Heather Arpin said the walk, which began last year, was intended to raise awareness about the issue of sexual violence and the availability of resources. “We want to show survivors and their families that the community cares about them,” she said. Funds raised will go toward the bridge fund, an account that helps survivors find transportation and a safe place to stay off-Island. Organizers were pleased with the turnout, which included men and women of all ages, as well as several dogs. Sarah Sylvia, who volunteered at Connect this year as part of an academic course requirement, brought her pug, Bruin, and her 10-year-old son, Riley. She said she hoped walking against sexual assault would be a learning experience for Riley. “I want him to grow up learning that it’s not okay,” she said. As they walked, vehicle drivers and passengers honked and waved in support. Along the route, the counselors had tacked facts and statistics about sexual assault on the telephone poles. Nearly one in five women have been sexually assaulted, according to a 2011 study by the Centers for Disease Control and Prevention. Though it’s less common, men too can be victims of sexual violence and harassment. Connect serves women and men across a wide age range, Ms. Neary said. “It affects everyone; not only the victims, but everyone who cares about them,” she said. Well done! Thank you for making this walk - a great cause. MV lucky to have such a supportive, caring and knowledgeable group of out-reach service providers at Community Services. Keep up the good work. Very glad that this issue is being brought to light. For so many years it was kept under the rug. In order to deal with it, we must acknowledge it exists. Thank you to all who have the courage to stand up for dignity and love and against sexual assault no matter what the circumstance.